“Mrs. Taylor was under my employment for two years at the Montgomery County Food Bank and continuously looked for ways to participate, lead, promote, and assist in the mission. Her experience, dedication, diligence and contacts in the community are HUGE asset. She is very organized and communicates well. Mrs. Taylor is extremely passionate about helping others which makes her a great PR person”. 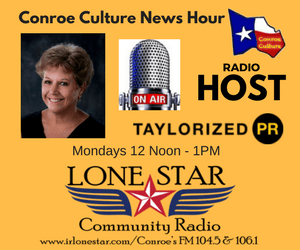 Conroe Culture is a weekly show every Monday at noon. Guests include local officials, school personnel, the Conroe/Lake Conroe Chamber, City of Conroe officials, local hospitals, small businesses, nonprofits, and upcoming events in Montgomery County. Each show is recorded for podcast and YouTube format, allowing unlimited playback. Sponsoring Conroe Culture includes audio spots, graphics logos on TV/YouTube, social media recognition, and an opportunity to reach an audience in Montgomery County. Affordable and customized to your business, not a system or package.